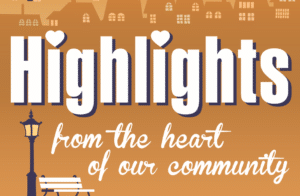 Highlights is a 30 minute weekly TV show featuring organizations, events, grass-roots efforts and people who move our state and community forward in a positive way. The show airing April 8, 2019 – April 15, 2019 ‘highlights’ the upoming 26th Annual WV Senior Sports Classic & the WV Music Hall of Fame. We interviewed Argyle McMillion, President of the WV Senior Sports Classic. He gave us an overview of the Classic. They are a non-profit organization created to promote and create interest in lifetime sports, recreation and physical exercise as a means of enhancing one’s quality of life. They sponsor an annual fitness event with several events for older adults 50 years of age and older. Some of the sports include: Pickleball, Basketball, Bowling, Archery, Golf, Track & Field and Softball. The event this year is May 2, 3 & 4, 2019 with events happening in and around the entire state of WV. Harold Vealey, Managing Director for WVSSC, discussed their affiliation with the National Senior Games Association which sponsors the National Senior Games held every two years. The National Games this year are being held in Albuquerque, NM and 2020, the games are in Fort Lauderdale, FL. He also publicly thanked Humana and Brickstreet for being major sponsors of the games. His sport is basketball. He encourage all folks 50+ to register for the games this year. They are holding a banquet on Friday evening, May 3, 2019 at Emmanuel Baptist Church on West Washington St in Charleston, WV. Click here to register for the games. Only $35. 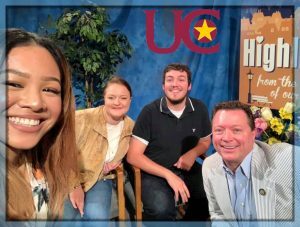 We also interviewed 3 University of Charleston students who are majoring in Integrated Communications. For their Senior Project, they have taken on the mission of helping the WV Music Hall of Fame. We talked with Kaitlyn Guynn, Blake Huffman and Kiara Briones, all 3 Seniors at UC. They are organizing 3 weekend events at the WV Music Hall of Fame store on the 2nd floor of the Charleston Town Center Mall. Dates include: April 13th – Trivia Night from 2-4:00, April 20th – Children’s Workshop from 2-3:00 and April 27th – Scavenger Hunt from noon-3:00. We also discussed the upcoming Garden Party on May 26, 2019 at Cafe’ Cimino, which is the WV Music HOF’s biggest fundraising event. Call the WV Music HOF at 304-342-4412 for more details.